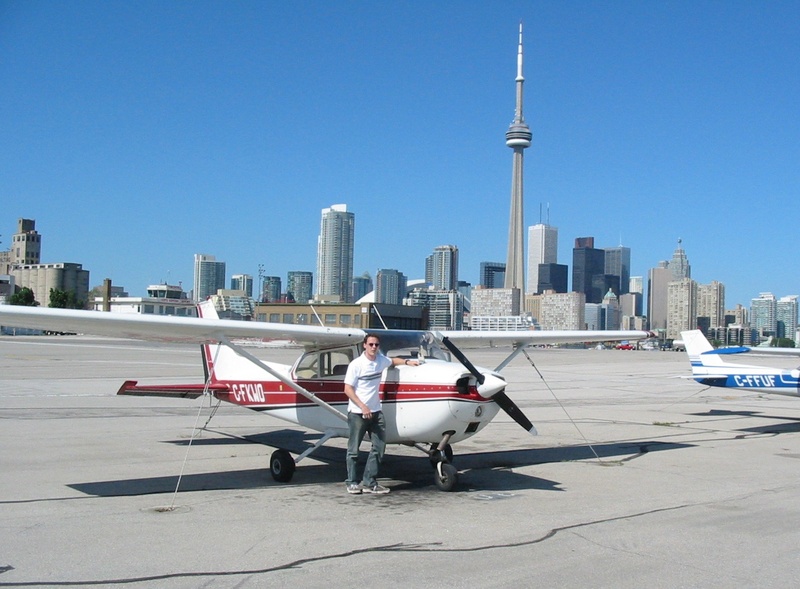 My research primarily involves combining geophysical modeling with spacecraft observations, especially relating to gravitational and magnetic fields, to constrain the evolution of planetary interiors and surfaces across our solar system and beyond. At the moment, I am most active in the areas of planetary interiors (especially icy moons), planetary magnetism (especially lunar magnetism), and space weathering. Hemingway, D. J. and Mittal, T. (in press), Enceladus' ice shell structure as a window on internal heat production. Icarus. Spring 2014: EART110C - The Dynamic Earth (aka Geophysics), Department of Earth and Planetary Sciences, University of California Santa Cruz. I am currently a Carnegie Postdoctoral Fellow in the Department of Terrestrial Magnetism at the Carnegie Institution for Science in Washington, DC, where I am hosted by Peter Driscoll. Prior to this, I was a Miller Fellow at the University of California Berkeley, hosted in the Department of Earth and Planetary Science by Michael Manga. I completed my PhD in August of 2015 in the Department of Earth and Planetary Sciences at the University of California Santa Cruz. My PhD advisors were Ian Garrick-Bethell and Francis Nimmo. My dissertation committee also included Gary Glatzmaier and Jasper Halekas. The surprising diversity among the outer solar system's satellites provides important clues about the formation and evolution of the giant planet systems and the solar system in general, and about what governs the behavior of these bodies today. Many of the icy satellites have very young surfaces, owing in some cases to ongoing geologic activity, and some appear to possess subsurface oceans, raising the intriguing possibility of habitable environments in the outer solar system. This backlit Cassini image of the South Polar region of Enceladus shows a series of ongoing eruptions taking place along the "Tiger Stripes". 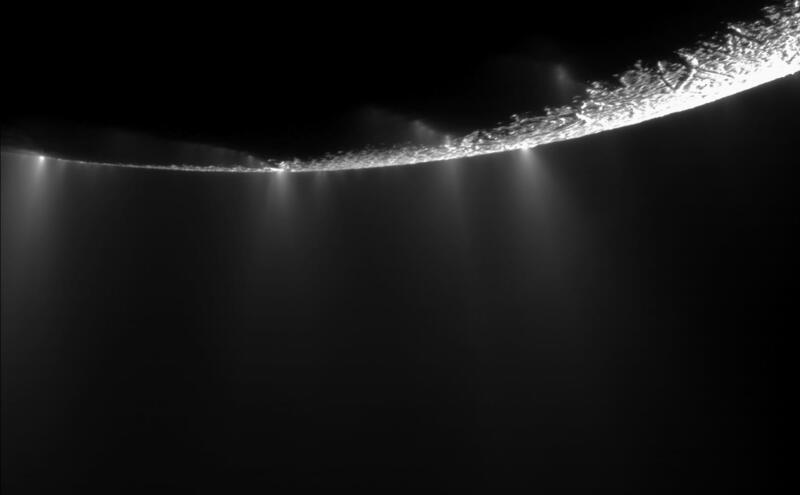 Although just a tiny (~500 km diameter) moon of Saturn, Enceladus is arguably one of the most compelling exploration targets in the solar system due to its spectacularly active south polar region, dominated by giant fractures and eruptions that spray water and organic molecules out into space, hinting at a potentially habitable subsurface liquid water environment beneath the icy surface. Following a series of close flybys by the remarkably successful Cassini spacecraft, it became possible to constrain the low-order gravity field. 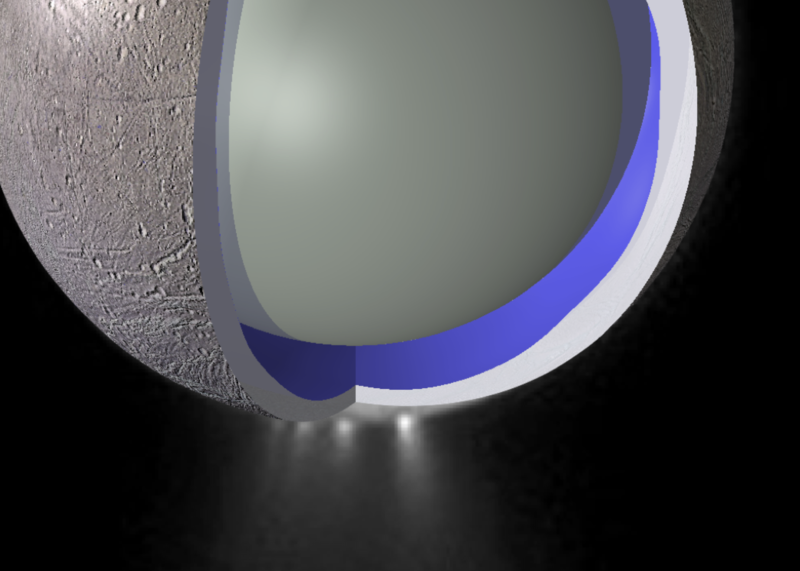 Combining this gravity field with the observed shape, we were able to obtain the first basic constraints on the interior structure of Enceladus, suggesting that it consists of a relatively thin ice shell, covering a subsurface liquid water ocean, overlying a low density core. Results of the gravity determination and our initial analysis of the interior are published in the 4 April 2014 issue of Science, and are also captured in this JPL press release. 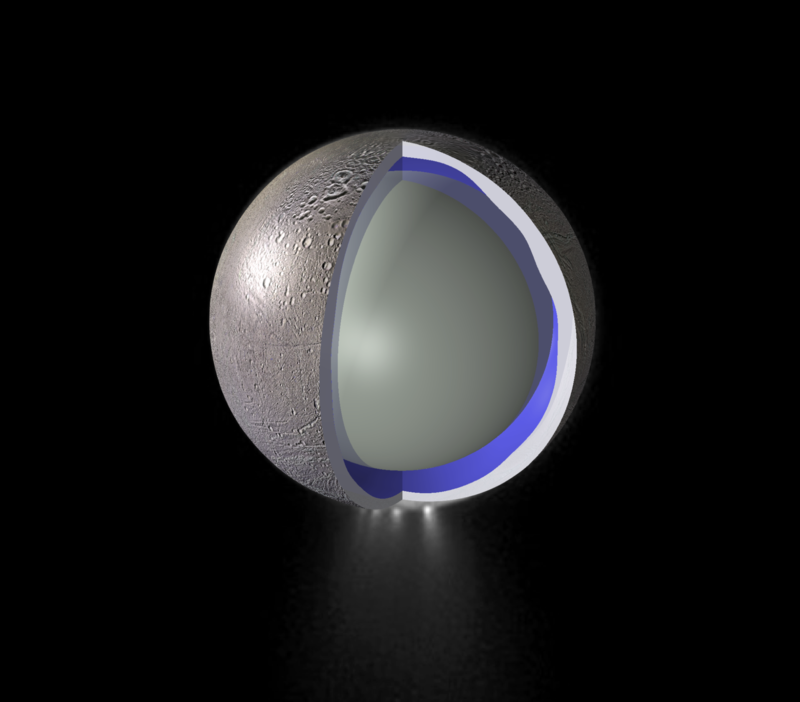 Interior modeling of Enceladus remains an active area of research, and is important because its internal structure tells us about the thermal state, evolution, and energy budget of this remarkable little world. Our understanding of the interior of Enceldus continues to develop, recently benefiting from measurements of its forced physical librations as well as improvements in equilibrium figure theory and revisions to our approach to modeling isostatic equilibrium (for a discussion of the latter point, see Hemingway and Matsuyama, 2017). Depiction of the approximate internal structure of Enceladus superimposed on a NASA/Cassini photograph of Enceladus showing its active south polar eruptions. Image credit: D. Hemingway. Several lines of evidence suggest that Saturn's largest moon, Titan, has a global subsurface ocean beneath an outer ice shell. Using topography and gravity field data derived from flybys of the Cassini spacecraft, we developed a model for the elastic thickness and loading history of Titan's ice shell. We conclude that Titan's ice shell is probably very rigid and that its surface has undergone hundreds of meters of erosion, with the sediment being redistributed on a global scale. Our results are published in the 29 August 2013 issue of Nature. A more general summary of the work is captured in a UCSC press release. 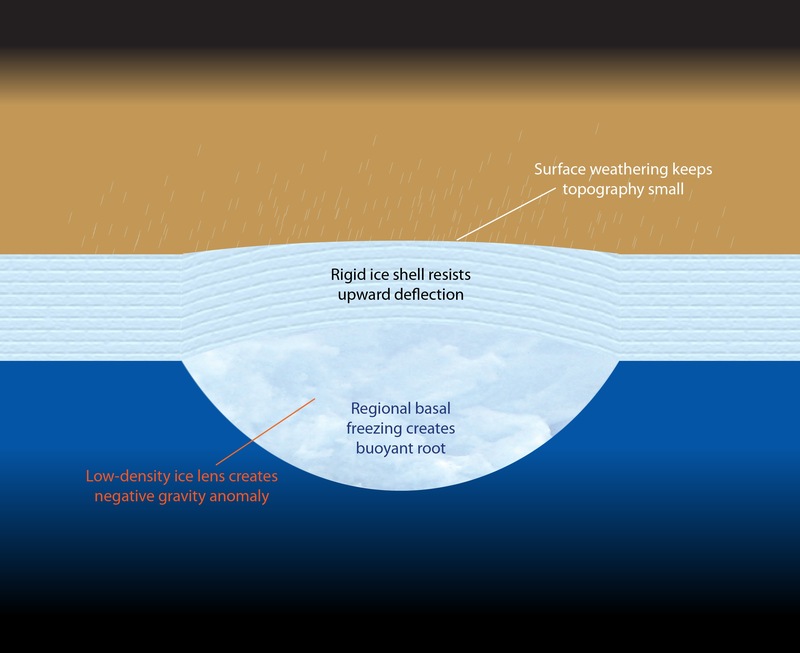 Cartoon depicts a cross-sectional view of Titan's ice shell sitting between the dense atmosphere and the underlying liquid ocean. Image credit: D. Hemingway. An enduring mystery since Apollo is that, in spite of the Moon's lack of a global magnetic field, the surface is nevertheless dotted with regional magnetic fields strong enough to be detected from orbit. Did the Moon once have an intrinsic global field that magnetized parts of the crust but has since decayed away? Why are the majority of the crustal magnetic anomalies concentrated around the northern and western parts of the South Pole-Aitken Basin? How are these parts of the crust so unusually rich in magnetic minerals? Contours show magnetic field strength at 30km altitude (derived from the Purucker and Nicholas, 2010 model) over Clementine 750 nm reflectance. 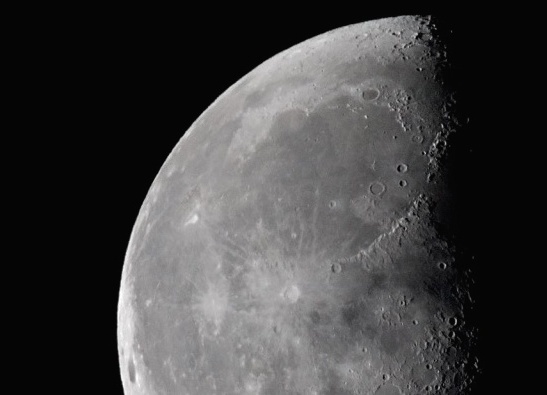 While the Moon does not currently possess a global magnetic field, its crust contains regions of stable remanent magnetization that have been detected by magnetometers aboard orbiting spacecraft. Curiously, many (but not all) of these magnetic anomalies are accompanied by complex sinuous patterns of bright surface markings known as swirls. Using Clementine albedo mosaics (available from the USGS) and magnetometer data from NASA's Lunar Prospector and the Japanese Kaguya mission, we examined the relationship between magnetic field direction and lunar swirl morphology, and showed (here) that the bright portions of swirls correspond with strongly horizontal magnetic fields while the intra-swirl dark lanes appear to be aligned with vertical magnetic fields. 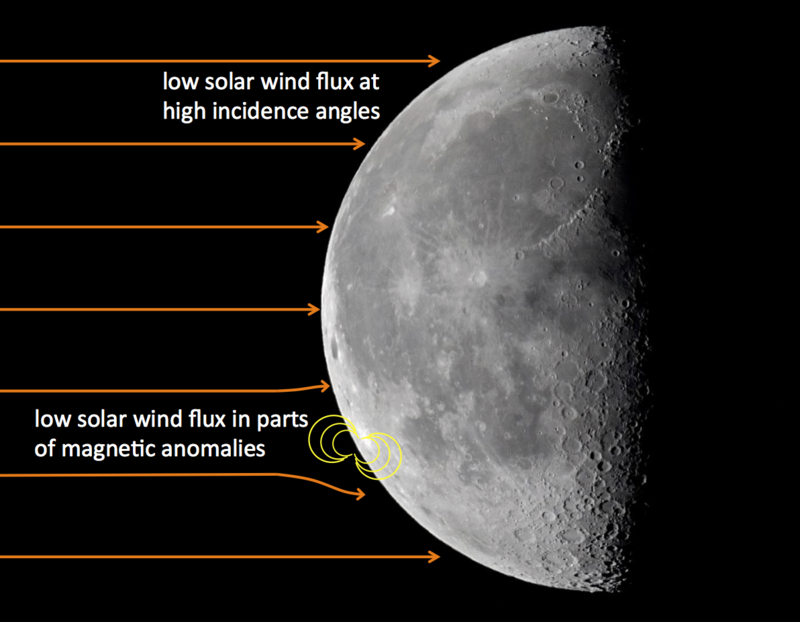 We developed magnetic source models for some of the Moon's magnetic anomalies and hope to test our model predictions by sending a low-cost, low-altitude cubesat mission to the Moon. Image shows horizontal magnetic field strength contours (derived from Lunar Prospector magnetometer data) over Clementine 750 nm reflectance. Image credit: D. Hemingway. To the extent that swirl morphology is controlled by field topology as described above, the optical patterns of swirls are effectively telling us about the structure of the near surface magnetic fields (on scales much finer than what can be resolved from orbit), which can in turn put stronger constraints on the structure of the underlying magnetic sources. 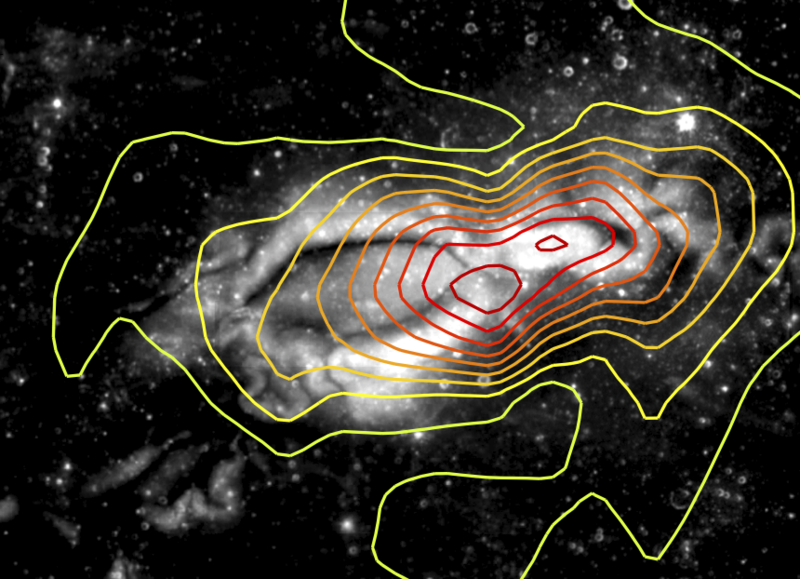 The alternating bright and dark markings suggest that magnetic field orientation transitions between vertical and horizontal on length scales of roughly 1-5 km. This requires the underlying magnetic source bodies to be both shallow and narrow. The corresondingly restricted volumes of the source bodies, combined with estimates of surface field strength, suggest magnetization intensities of perhaps 0.5–2 A/m—far in excess of what is typical of mare basalts found in the sample record. The magnetic sources must therefore have elevated metal content due either to unusual source materials or to some process of magnetic enhancement. 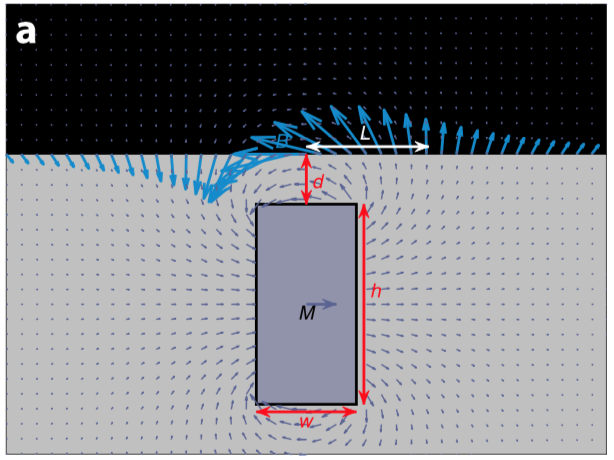 Model cross section of buried magnetized rectangular prism illustrating the relationship between its width (w), height (h), burial depth (d), and the length scale (L) over which the surface field orientation transitions between vertical and horizontal. Image credit: D. Hemingway. Short of direct sampling of the objects in our solar system (which is enormously difficult and expensive), the only way we know what anything is made of is by looking at its spectra. 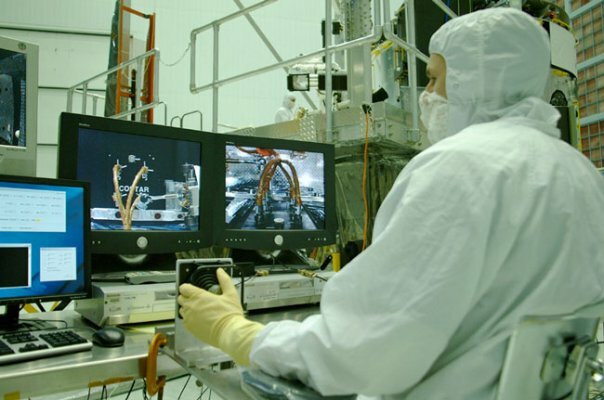 Unfortunately, the harsh environment of space alters the spectra of exposed bodies, sometimes masking the crucial features that allow for compositional analysis. 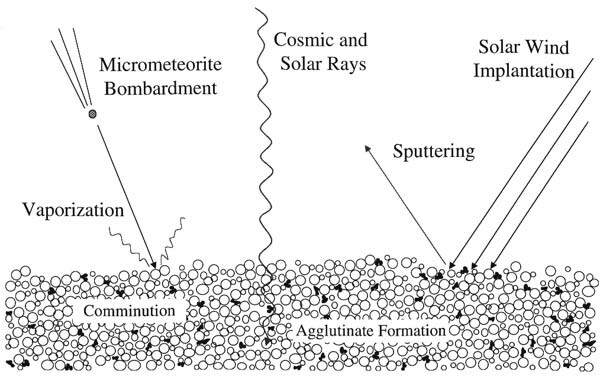 This gradual alteration of optical properties, known as "space weathering", is thought to be caused mainly by bombardment by solar wind and micrometeoroids. However, the details of these processes, including the distinct effects of the different weathering agents and the associated timescales, are not yet well understood. 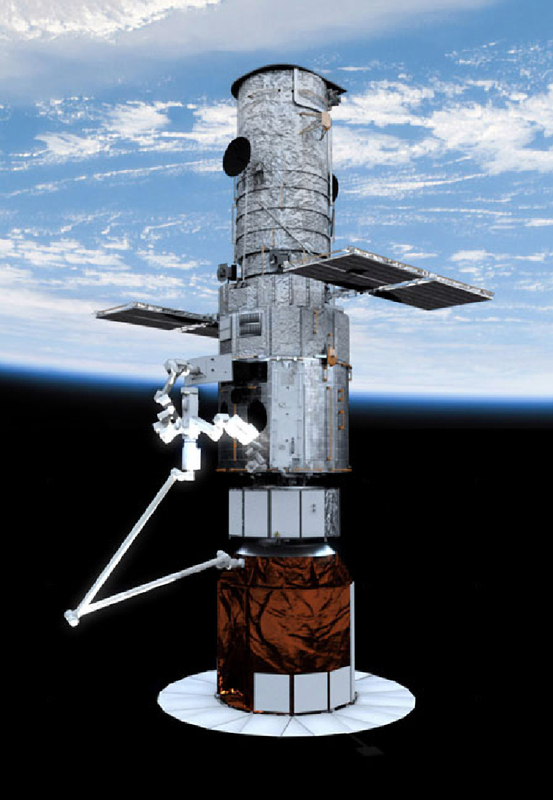 Sarah Noble's classic illustration of space weathering. The color variations we see across the Moon's surface are mainly a function of composition. The bright highlands are the Moon's ancient iron-poor anorthositic crust and the darker maria are iron-rich volcanic flows that erupted later to fill in many of the major impact basins on the near side. But beyond this basic dichotomy, there are additional, subtler variations in optical properties, some of which reflect finer gradations in composition (e.g., iron and titanium content varies among the different flood basalts), and some of which are a result of space weathering processes. In particular, the color of the Moon appears to vary systematically with latitude, with low latitude regions being relatively darker than high latitudes. To the extent that the optical properties of the lunar surface are affected by solar wind flux, this observation makes perfect sense. Moreover, the characteristics of this latitudinal color trend match the signature of "lunar swirls", where strong magnetic fields locally alter the surface's exposure to the incoming solar wind. Cartoon illustrates that solar wind flux is reduced both at high latitudes and at crustal magnetic anomalies. Image credit: D. Hemingway. Color variation as a function of latitude, including comparison with swirl-related color trends. For more details, see the paper. Image credit: D. Hemingway.